In today's information age, the Assamese language needs to be at par with other languages of the world. Hence, the need for a Dictionary App has been long pending. Axomi is the world's first-ever English-Assamese Dictionary App developed in 2014. However, due to lack of funds, it could not be developed further and hence, has gone quite outdated. This app has helped many learn the language and in many other literary purposes. I am a software developer and started developing this app in 2013 with the help of a few like-minded individuals like Bikram M. Barua of Xobdo. In 2014, I completed the basic app which was launched in the Google PlayStore, iOS AppStore, Windows Marketplace, Amazon Store and Opera Store. However, as mentioned above, to further develop the app, i.e. to add more features to the app and keep adding vocabulary, constant updation is required. For the same, there needs to be a dedicated team working on the app. Due to lack of funds, this wasn't possible and as it shows, the app hasn't been updated since. To develop this App and make it available for iOS as well as Android, we would need to engage a team and pay the bills involved in the same. Further, the website www.axomi.co.in also needs to be maintained. Once the revamping of the App as well as the website is complete, further maintenance will be completely covered by me. My dream is to have an app where people can learn the Assamese language with ease and most importantly, for free. I don't want the app to be ad-based because that would negate the whole purpose for the community. For these reasons, I seek your help. Kindly fund the project and help the Assamese language reach the heights it deserves. Click here to try the app on your Android device. Click here to visit us on our Website. Click here to visit us in Facebook. 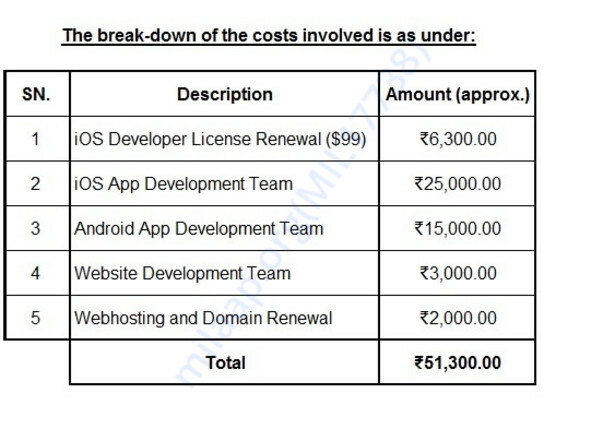 The withdrawn amount is being used to pay a part of the Apple Developer fees for one year. The remaining part is being paid by me. Thank you so much for the support. Please keep sharing the campaign with your friends and family.